Four hungry wolves in continuous search of the “Holy Cave of Reverb”. That classic surf tone topped with some catchy spy, ska and 60’s melodies. 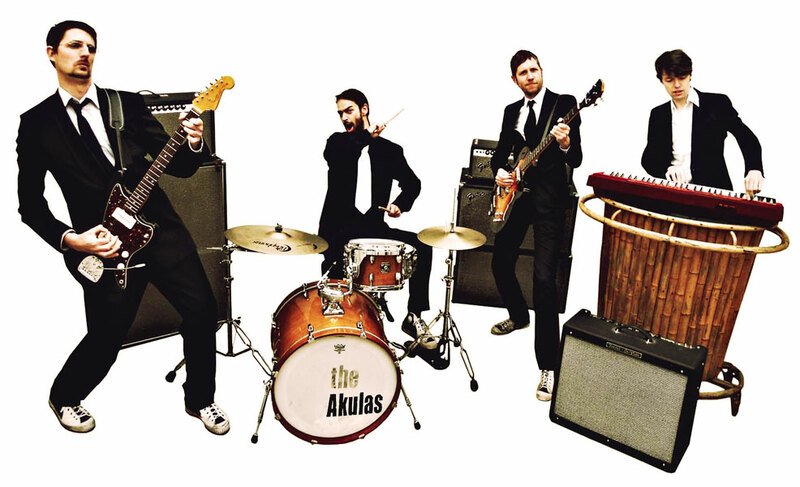 The Akulas are Udo — Gretsch drums, Willem — Framus Star bass driven by a Fender Bassman 100, Benjamin — Nord organ and Ruben — Fender Jaguar & Jazzmaster driven by a Fender Dual Showman Reverb and a Fender Reverb Tank. Enter your e–mail to keep in tune about all things Akulas. Don’t worry, we don’t bother with any Viagra or Rolex promo. An evening of surf music & culture, part III. Six of the best European surf bands, plus a mini market with tiki art & fashion (Greaser & the Doll), surf record store (Surfin's Back Again) and barber shop (Bigsby). Line up: Bradipos IV (I) - Del-Toros (NL) - Aloha Sluts (NL) - Terrorsaurs (UK) - The Akulas (B) - Hicadoolas (D)! Voor Kom op tegen kanker. line up: The Sangriola's, Romeo Spinelli, Juliette et ses Baguettes, Surprise act, The Akulas, And they spoke in anthems, Los Fabulous Frankies, The Happy Uncle, The Kids, Flyn en Thee Monstrophonic Five en als kers op de taart reunie optreden van The O'Haras!! Complete Rock 'n' Roll, vintage car and hot rods festival weekend! A whole bunch of bands playing and 2 'surf' bands The Akulas and The Biarritz Boys (NL)! First Akulas gig in Germany ever! Also playing Los Mosquitos (Köln)! Past Gigs or RSS Feed available. Bar ou ailleurs qui sait?